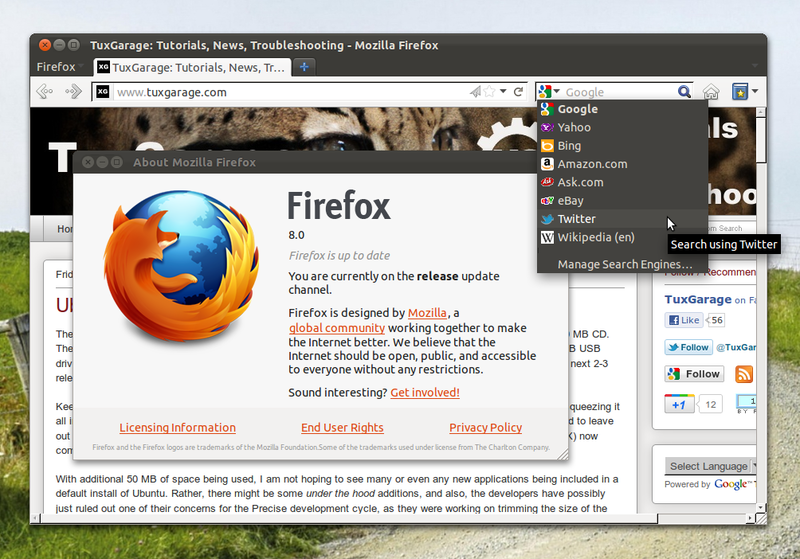 Thanks to the fast release cycle, Firefox 8 was released yesterday. The most important new features include disabling add-ons installed by third-party programs by default, Twitter search engine and a preference to load tabs on demand when restoring saved sessions. 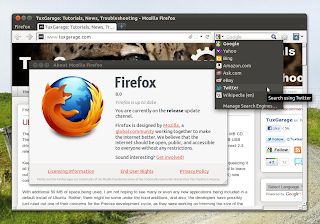 Update 11/16/2011: Firefox 8 was now finally published to its Stable PPA, but hasn't arrived the official repositories yet, that should take just one or two days from now. Added Twitter to the search bar for select locales. Additional locale support will be added in the future. Improved performance and memory handling when using audio and video elements. Added CORS support for cross-domain textures in WebGL. Added support for HTML5 context menus. Improved CSS hyphen support for many languages. 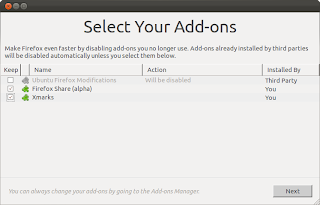 You may want to re-enable the 'Ubuntu Firefox Modifications' add-on on the first run. Update 11/21/2011: As Firefox 8 packages still aren't released to the official repos, I've started to wonder if they ever will. So here is another way to do a proper installation via a repository, to first integrate it better into the system, and also get future updates automatically: Ubuntuzilla.